Ruby is one tough cookie. Self-confident and independent, shes a neo-classic gum shoe, like a Sam Spade meets Han Solo in a female form. Highly intelligent and resourceful, Ruby is still basically a woman of action. 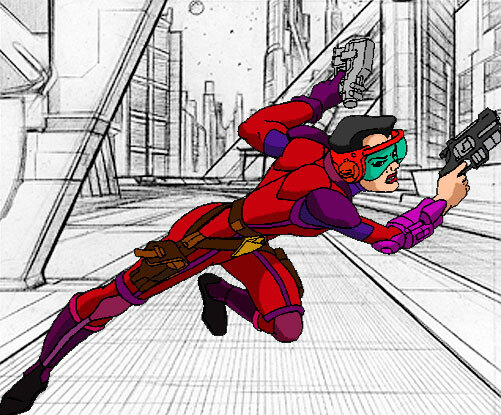 Armed with her sharp mind and rapier wit, Ruby is more than a match for any human or alien foe who crosses her path. But Ruby also possesses a special gift; she can slow down time. This comes in handy when you need to dodge a laser blast or the swing of a bad guys energy-blade, allowing her to side-step danger and returns the favor with a blast from her Smith-Asahi Godzilla Blaster with a signature response, heres a kiss for ya.